A terrorist attack involving suicide bombings and gunfights with police in the center of the Indonesian capital, Jakarta has left at least seven people dead. According to Al Jazeera, a Dutch national working for UN was among the dead. The Jakarta police said on their Twitter account that the explosions went off in front of the Sarinah shopping mall. 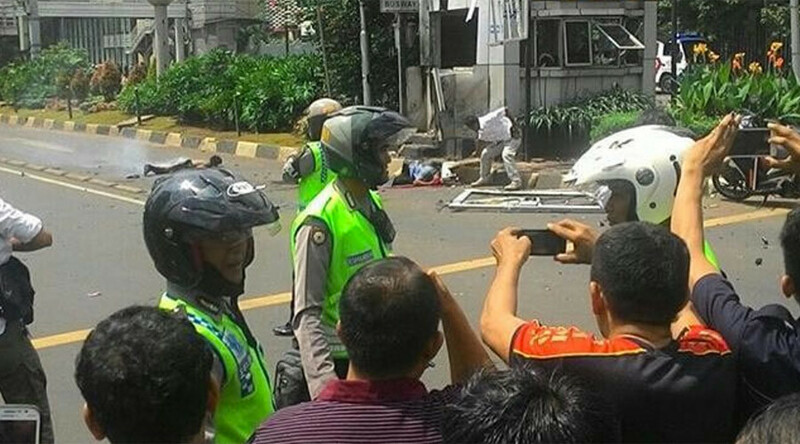 Police say attackers arrived on motorcycles and threw grenades, ABC’s Indonesia correspondent Adam Harvey reported. There were 10 to 14 attackers involved in the Jakarta attacks, the channel reported, citing local media. Following the blasts, police said that Islamic State militants might have been behind them. "We have previously received a threat from Islamic State that Indonesia will be in the spotlight," police spokesman Anton Charliyan said. Later, however, Sutiyoso, the head of the Indonesian national intelligence agency, told Reuters that while the Jakarta attacks were acts of terrorism, there wasn’t any indication that Islamic State was behind them. "This is definitely terrorism, but there are no indications yet that it's ISIS-related," said intel chief Sutiyoso, who uses one name, according to his official agency profile. Islamic State has said it was behind the deadly Jakarta terror attacks, saying it targeted foreign nationals and security forces, Reuters reported, citing an Islamic State-allied news agency. Several suicide bombers set off the explosions, Reuters quoted Indonesia’s national police spokesman as saying. Four people suspected of involvement in the attacks have been arrested, Indonesian police said. Images from the scene reveal that the explosions caused damage to a checkpoint near the UN Information Center and a Starbucks coffee shop. “The Starbucks cafe windows are blown out. I see three dead people on the road. There has been a lull in the shooting but someone is on the roof of the building and police are aiming their guns at him,” a Reuters photographer reported from the city center. Police are asking people to stay away from windows, Jeremy Douglas, a United Nations Regional Representative, tweeted from the UN building. There are also several luxury hotels, offices and embassies, including that of France, in the area where the blasts occurred. Police have cordoned off the area and are keeping reporters away from the scene.